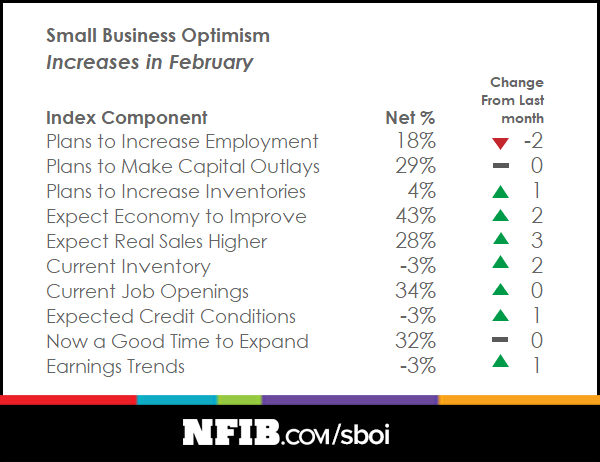 While it has been accused in the past of pandering to various political organizations, the NFIB Small Business Economic Trends Survey nonetheless reflects the mood of America's main street corporations. 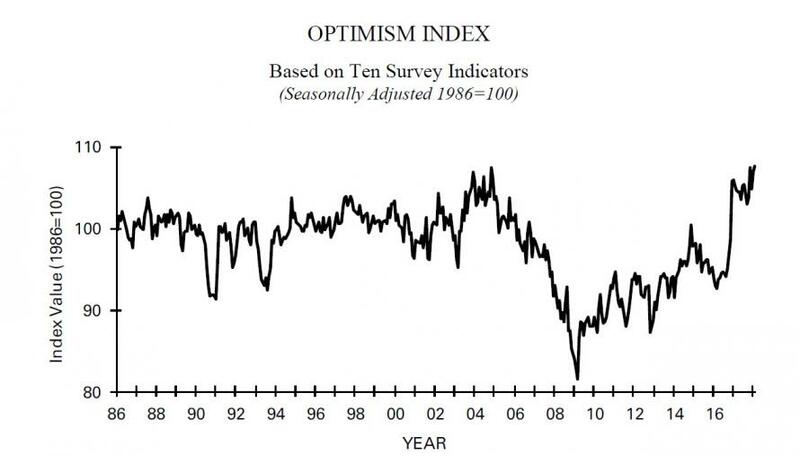 And according to the March release of the NFIB index, small business owners are showing "unprecedented confidence" in the economy as the optimism index continues at record high numbers, rising 0.7 points in February to 107.6 and above the 107.1 expected, the second highest level in its 45-year history, second only to the 108.0 reading in 1983. The historically high numbers include a jump in small business owners increasing capital outlays and raising compensation. 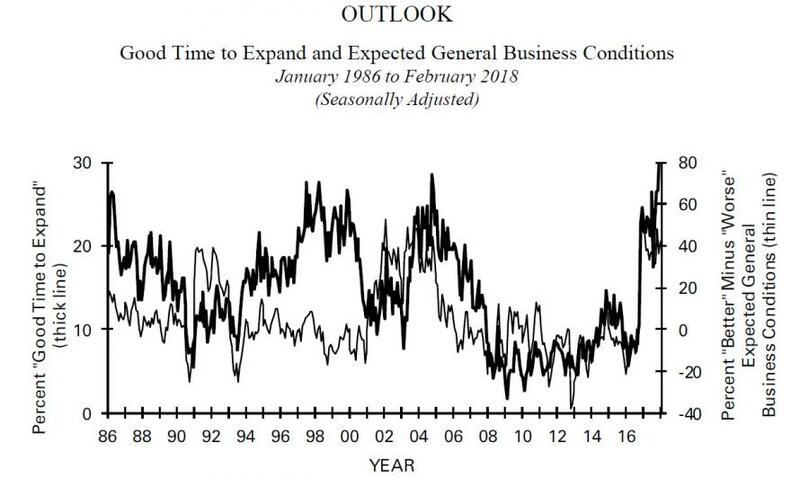 The small business outlook, or the percentage of respondents saying it is a "good time to expand" and who generally view expected business conditions favorably, rose to a record high. One would almost think that America's small business federation absolutely loves the Trump administration. And indeed, for the first time since 2006, the survey showed that taxes received the fewest votes as the number one business problem for small business. The February report shows several components of the Index reached noteworthy highs. In a sign that small businesses are confident and expect growth, a net 22 percent of owners are planning to raise worker compensation and 66 percent reported capital outlays, up five points from January and the highest reading since 2004. 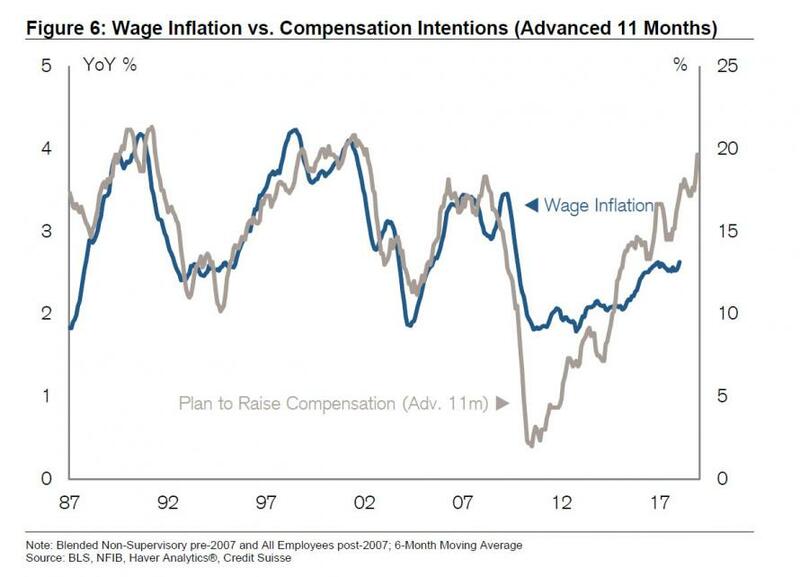 Then again, as we have shown before it is one thing to think about raising compensation (or boosting CapEx); it is something entirely different to do it. Additionally, small business owners are also expecting higher real sales rose three points to a net 28 percent, one of the best readings since 2007. Owners also reported higher nominal sales in the past three months at a net eight percent of all owners. The net percent of owners reporting inventory increases rose three percentage points to a net seven percent on top of a six-point rise in January. Job creation remained strong in February, as reported in the NFIB February Jobs Report, released last week. Finding qualified workers remained as the number one problem for small business owners, surpassing taxes and regulations which have held the top two spots for years.